Is your home in desperate need of new floors? Are you tired of your current flooring dragging down the overall appearance of your home? Are you ready to make a change, but unsure if it fits your budget? While there’s a lot to think about for your next home remodel project, the first thing you may have to address is cost. You can have a lot of fun comparing flooring options, but there will come a time when you need to get serious in regards to your budget. If you have enough cash on hand to comfortably pay for the project in full you may want to take this approach, as to avoid carrying any debt. But if you don’t have enough cash, you need to look into your other payment options. A store credit card often appears to be the best idea, until you come to find that the interest rate may be much higher than expected. This may lead you toward getting a personal loan for your new floors. With a personal loan, you can choose how much you want to borrow up to the lender’s maximum and also choose your repayment term from the terms offered. This way, you can repay the loan in fixed monthly payments that you know are manageable for you. Even better, rates may be lower than what you’ll find with a traditional or store credit card. Read more about loans for home remodels and repairs. Before we discuss the many types of floors, let’s first address an important question: will you tackle this project yourself or hire a professional? There is no right or wrong answer when addressing the question of whether you should hire a professional to install your flooring. This comes down to personal preference, time, and money. Now that you know who’s doing the work, it’s time to settle on a product. This is where the real fun begins. It’s important to learn more about each type of floor, including a basic breakdown of the pros and cons as they pertain to your home and personal tastes. For example, some people enjoy carpet because it’s soft on their feet and available in a variety of colors. Others, however, enjoy the classic look of hardwood floors. Furthermore, there are many products that look like solid hardwood – such as engineered wood and laminate – but are more affordably priced. Are you trying to match your floors to a particular style, such as traditional or farmhouse? Do you have a specific color scheme in mind? What’s your budget per square foot for new flooring? If you’re doing the job yourself, do you have the tools and knowledge necessary to achieve professional level results? By answering these questions, among others, you’ll soon have a clear idea of which type of floors make the most sense. 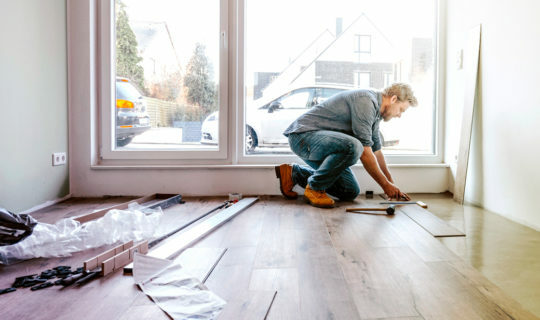 Once you pick out flooring and have a clear idea of the total cost, you can apply for a personal loan, receive a decision, and obtain the funds within a few days (most of the time). Estimate the payments of a Discover Personal Loan by using our calculator. From there, it won’t be long before you’re enjoying your new floors!